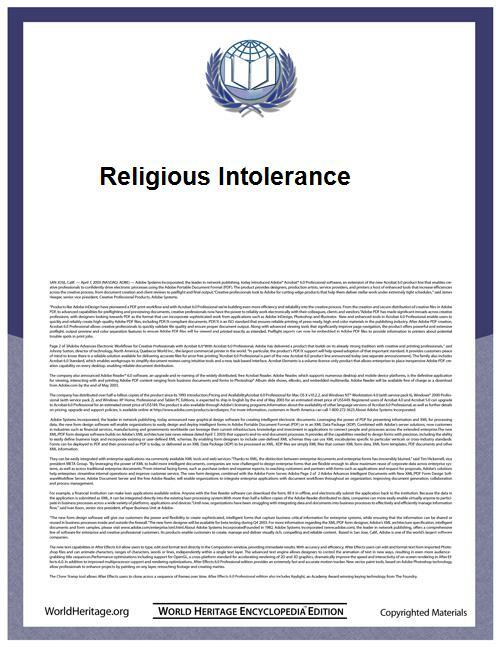 Religious intolerance, rather, is when a group (e.g., a society, religious group, non-religious group) specifically refuses to tolerate practices, persons or beliefs on religious grounds (i.e., intolerance in practice). The constitutions of some countries contain provisions expressly forbidding the state from engaging in certain acts of religious intolerance or preference within its own borders; examples include The First Amendment of the United States Constitution. Other examples are Article 4 of the Basic Law of Germany, Article 44.2.1 of the Constitution of The Republic of Ireland, Article 40 of the Estonian Constitution, Article 24 of the Constitution of Turkey and Article 36 of the Constitution of the People's Republic of China, and Article 3 Section 5 of the 1987 Constitution of the Philippines. The precise definition of "religion", and to which groups it applies, can also cause controversy, for example the case of freedom of speech; whilst in France being convicted of incitement to religious hatred can carry a maximum of 18 months in prison. An attempt to pass a similar law by Tony Blair's Labour government in the United Kingdom had to be dropped in April, 2006 after criticism that it restricted free speech. In Victoria, Australia the Racial and Religious Tolerance Act 2001 makes illegal "conduct that incites hatred against, serious contempt for, or revulsion or severe ridicule of, that other person or class of persons" on the grounds of religious belief. ^ Toynbee, Arnold (1947). "Failure of Self-Determination". In Dorothea Grace Somervell. A Study of History: Abridgment of Volumes I - VI. New York, NY: Oxford University Press. p. 300. ^ "Estonia - Constitution", ICL Document 28 June 1992, retrieved 25 May 2007. ^ "International Religious Freedom Act of 1998", 27 January 1998, retrieved 25 May 2007. ^ "United States Commission on International Freedom of Religion", Press Releases 2000, retrieved 25 May 2007. ^ "Official Declaration", Church of Jesus Christ of Latter-day Saints, 6 October 1890, retrieved 25 May 2007.